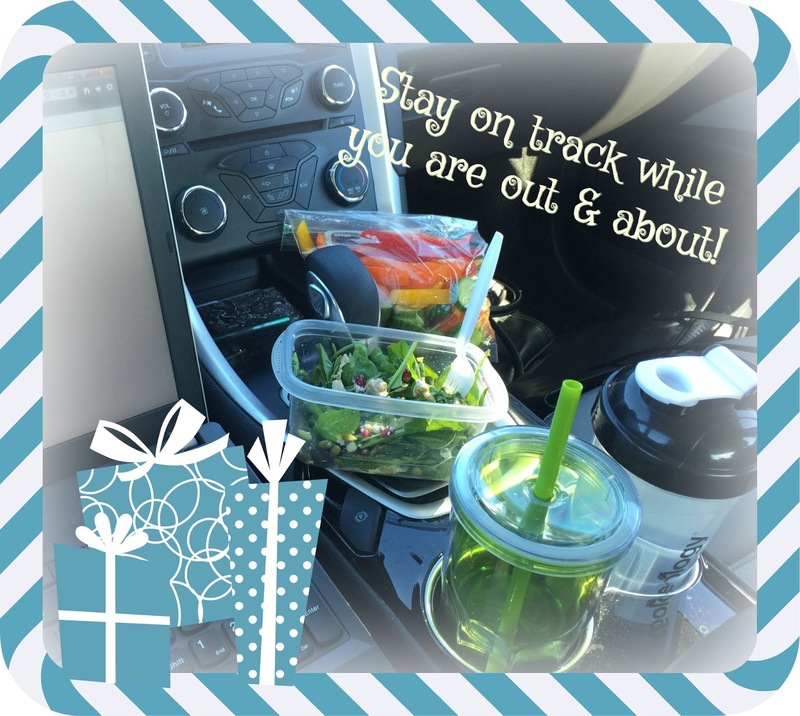 The Family Table with Genevieve: Stay on track this holiday season! 'Tis the season for running around... errands....shopping....kids' activities...more shopping! Like a lot of mamas out there, I spend a lot of my day in the car. Not only taking kids to and from activities and running errands, but I also work full time. My job consists of about 60-70% of my week travelling. Thankfully not overnight travel, but I often spend 2-4 hours of my day in the car travelling to visit my sales reps.
All that time in the car can add up to a lot of bad choices if you don't plan ahead! The drive thru's and highway rest areas are easy..yes, but most often don't contain the best choices for food & drinks or they are expensive. And it's not just drive time... an office job also has lots of food temptations... potlucks or menus for ordering out. These temptations rise even more this time of year. 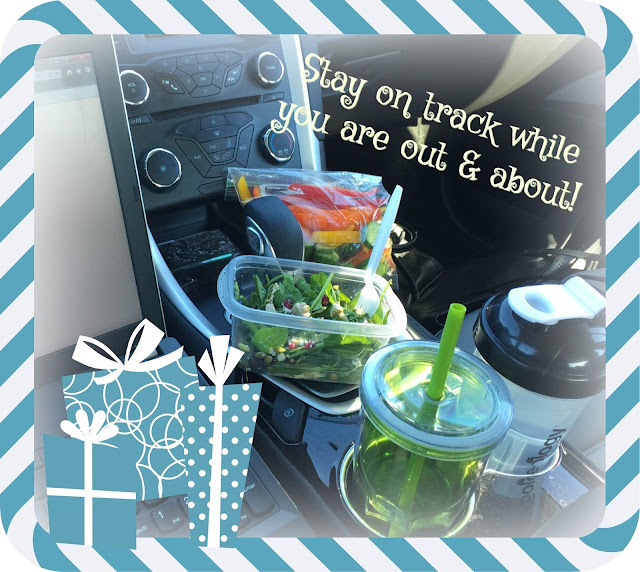 Between office snacks, cookie exchanges, and extra car time running around, I thought it was a good time to share some of my tips for staying on track. Part of my meal prep each week involves my food for travel days, as well as snacks for the kids' lunches and snacks for after school. This is pretty much what heads out the door each morning! The kids have their lunch, snacks and water bottles and I have the same! Not pictured is the kid's treat...they do get a treat each day with their lunch. The highlight of their morning is picking that treat! I snapped this pic before they were up. Lately the treat of choice is a piece of their Halloween candy...which at the rate we are going should last until the end of the school year! I almost always take the same basic things each day. Fruit...This is my mid-morning snack. I take something in season...lately it's been pears. I cannot eat enough pears...they have been so good! I was taking apples the last two months and after pears are done I will probably take a couple clementines. Hardboiled Eggs...These are such a great source of protein and the perfect portable snack. I have one with my fruit in the morning and the other with my lunch. Lunch...I usually take one of two things, salad or lettuce wraps. I try to add in some protein with turkey, chicken or beans. Afternoon snack...Veggies and Hummus. Super simple snack! Water....lots of water. I bring two 50oz bottles of water with me. One I drink before lunch. I usually bring a can of seltzer to have with my lunch and then I drink the second water in the afternoon. The kids should definitely be a part of all this prep. They usually help portion out their fruits & veggies or put popcorn into individual portions. We also make our own trail mix. Paul and the kids both love to grab a handful to tie them over in the afternoon. We put unsalted cashews, almonds, dried cherries and dark chocolate pieces in ours. Again, an easy thing for the kids to mix up. We keep it all in an airtight container in the kitchen. So these are a few tips to help you keep on track everyday. And especially during these next few weeks when we all seem to be running around a little more and some of our meals are eaten in the car! Do you have any tips for staying on track? Ideas for car snacks?? We will be back tomorrow with Friday favorites....talking about our favorite things from the week. I hope you will join us...there's always room for one more at our family table.